NRG has a unique combination of key features that make it one of the most powerful and adaptable Business Intelligence tools in the market today. NRG is very easy to use. Powerful dictionary features such as composites, constants and table includes combined with NRG's virtual file processing hide the complexity of an applications data structures from the user. This means that the user can simply concentrate on designing their report. NRG DESIGN has a comprehensive list of functions that allow the user to manipulate the data in any way required. The product has an automatic "read ahead" feature that allows flexible report formatting and advanced functions such as "percent of total" and "select on total" that other products do not support. Whilst many client only solutions offer ODBC connection as a way of accessing data on the server this introduces additional costs for ODBC licences and significant network overhead as large volumes of data are transferred across the network. These two factors render the client only solution ineffective when larger databases are involved. NRG USER can process its data on the client PC or in conjunction with NRG SERVER giving maximum operational flexibility. With NRG SERVER the need for costly ODBC licences is removed as NRG accesses the data directly on the server. Server processing greatly improves performance, eliminating the network inefficiencies, as only the design details are passed from the client to the server (taking only seconds) and only the processed data (the .NRG file containing only the report output) is passed back to the client. The market for report writers is heavily fragmented by more than 25 operating systems and more than 40 database variants. NRG has been uniquely designed to address all market segments and provide native database support to give both performance benefits and full support for all data types within any given database. There is this same OPEN approach when considering database connectivity. NRG uses native database access where possible to gain maximum performance when processing data. This is achieved through NRG filehandlers. There are filehandlers available for all the major 3GL and 4GL file management systems. 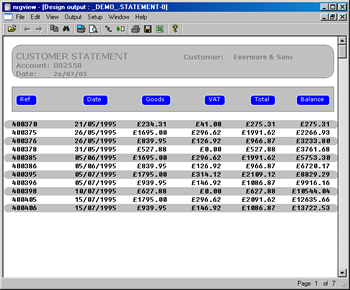 The product supports multiple filehandlers so data from two different databases can be combined onto one report. NRG's virtual file processing provides a constant high level of data access support ensuring maximum functionality irrespective of the file management system being used. NRG has been designed with portability in mind and is available on all popular client and server operating systems. This is particularly important in the corporate environment where there may be more than one operating system in use. NRG is particularly flexible in terms of the many options of output format. Output from a report can be sent to server or client printers, disk files, directly into EXCEL or to be viewed on a PC screen in the recently upgraded viewer component of NRG. The viewer component is very powerful in giving control over viewing of larger reports on screen. 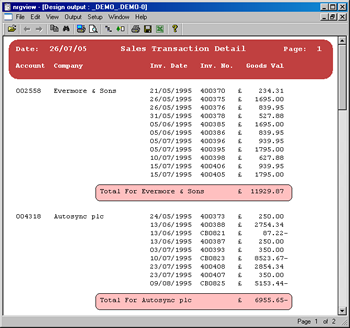 The 'tree view' of the report allows an end user to go directly to any particular part of a report instead of having to scroll down the whole report to get to the required information. Search facilities and the ability to print selected pages from a report further enhance this feature. 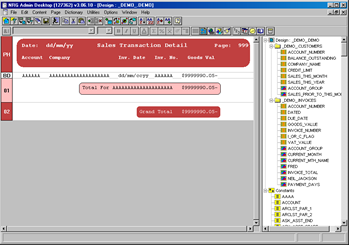 The NRG design concept delivers the user interface and the report writing engine as a number of separate components. This allows NRG to provide a high level of integration with the software application. All the report writing engine functions can be accessed using command line processing. This is particularly important for the more sophisticated business applications where it is necessary to keep control of the reporting function.